Go to Administer » Site building » Modules and click on To Do Action to install the Action extension for the To Do module. This module requires the installation of the Drupal Core Trigger module. 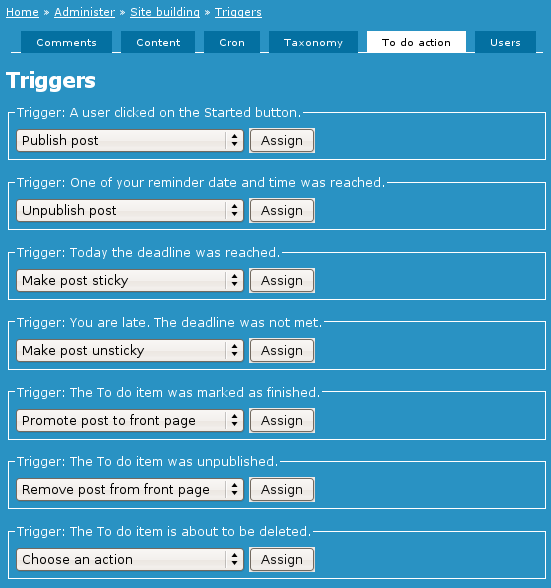 The To Do Action sub-module is used to enable To Do triggers. By default, the To Do system has a set of callback API that are not connected to anything. Install the To Do Action and you will get Drupal Core triggers called. You can then create a set of actions to apply to those triggers such as an action to send an email to a user. The triggers currently available are as follow. Click the figure to see a full scale version (1:1). The issue status was just set to Started. To avoid this trigger when editing a started item, make sure to select the Auto-change "Started" to "In Progress" checkbox in the global settings. This trigger is sent by the CRON system whenever it detects that the deadline is approaching. When the reminders are being sent is defined in the global settings. If all the reminders are clear (i.e. empty string,) then no reminder is sent. On the day the deadline is reached, the CRON system generates this trigger. The day after the deadline, the CRON system generates this trigger. Note that this trigger is called once a day until the issue is marked finished or the deadline is pushed. The issue status was just set to Finished. Note that we do not expect users to edit a Finished task once marked Finished. However, it is to be noted that this trigger will be sent each time such an item is edited. The To Do item node was unpublished. Note that editing a To Do item and marking it unpublished will also trigger the event. The node is already unpublished when this action is called. Whenever you allow for automatic deletion, or you directly delete a To Do item, this trigger is generated. Note that the deletion trigger is called AFTER the node was already deleted from the database3. This sub-module requires the Trigger Drupal Core module. Some of the triggers only work when a valid CRON is functional on your system. The others will work without CRON. 1. a. b. c. Requires CRON to function. 2. a. b. Requires CRON for the automatic function. 3. The Deleting trigger is called after the node was deleted which means that the callee cannot re-load the node from the database.